Danny Lennon will run the rule over the defender in a friendly against Queen of the South. 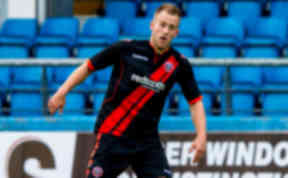 Danny Grainger will play as a trialist for St Mirren against Queen of the South as Danny Lennon runs the rule over the former Hearts defender. Grainger, who left Tynecastle at the end of the season, has been training with the Paisley club as he searches for a new side. He has spent time training with Sheffield United and Blackpool this summer. The 26-year-old left-back will get a chance to impress when Saints take on Division Two champions Queen of the South in Dumfries. Grainger is available as a free agent after ending his two-year spell at Hearts. The defender, who was part of the 2012 Scottish Cup-winning team, missed the majority of last season with a cruciate ligament injury. St Mirren's regular left-back last season was Newcastle United loanee Paul Dummett, who has signed a new contract at St James' Park and is unlikely to return to Paisley.